The Pirates secured a five-game sweep of the Brewers with a walk-off win Sunday. Pittsburgh headed into the bottom of the 10th inning trailing Milwaukee 6-5 at PNC Park. But, the Pirates plated two runs in the frame to secure the 7-6 victory. Gregory Polanco began Pittsburgh’s comeback with a one-out single. Colin Moran followed with a single of his own two batters later, pushing Polanco to third. 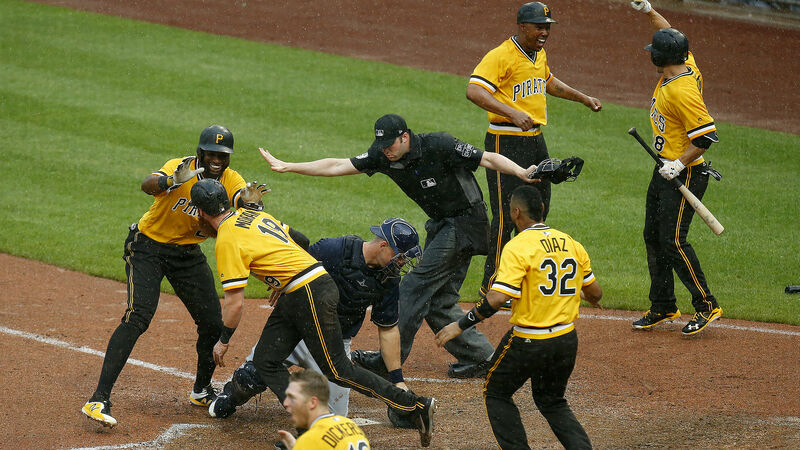 Then, with the Pirates down to their final out in the pouring rain, Josh Bell laced a line drive over the head of Brewers centerfielder Lorenzo Cain for a two-RBI double, securing the Pittsburgh victory. Down a run. Down to their last out. In the pouring rain. Pittsburgh outfielder Corey Dickerson also tallied two RBIs in the game. Brett Phillips drove in four runs for the Brewers in the losing effort. The Pirates enter the All-Star break with a 48-49 record after they topped the Brewers in five straight games this week, including a doubleheader sweep Saturday. Milwaukee fell to 55-43 with the loss Sunday. Indians infielder José Ramírez became just the fifth player ever to hit 25 home runs and steal 20 bases before the All-Star Break. José Ramírez is the 5th player ever with 25 homers and 20 stolen bases at the All-Star Break. Julio Teheran threw 6 1/3 scoreless innings in the Braves 5-1 victory over the Diamondbacks. Mets reliever Anthony Swarzak allowed two runs and failed to record an out in his team’s 6-1 loss to the Nationals. Royals reliever Enny Romero surrendered five earned runs in one inning on the mound against the White Sox. Kansas City fell 10-1. Dodgers infielder Enrique Hernandez made a sliding, over-the-shoulder catch against the Angels. MLB Home Run Derby 2018 (8 p.m. ET) — MLB will continue its All-Star festivities with the home run derby at Nationals Park on Monday. Bryce Harper will attempt to come away with a victory in his home stadium, while Dodgers slugger Max Muncy will look to put on a power display. Jesus Aguilar, Rhys Hoskins, Alex Bregman, Kyle Schwarber, Freddie Freeman and Javier Baez round out the field. Who is Clare Craig? Tommy Fleetwood’s wife – when did Ryder Cup 2018 golf ace marry her and how many children do the couple have?